is best in corporate America. must export its virtues to Europe. Whenever lists of America's brightest and best are compiled 3M is guaranteed to feature. 3M was born early this century as Minnesota Mining & Manufacturing. The mining soon ceased when the company's founders failed to dig up the corundum they needed. So they turned to trading in sandpaper, a product that uses the abrasive corundum. From the beginning the company was forced to innovate or die. Today 3M’s headquarters and many of its laboratories are in St Paul, Minnesota. Most of its customers are other industrial concerns. Its 60,000 products range from medical-imaging equipment to Scotch tape to abrasives for the car industry. With that unpromising background, how has the company been so successful? When asked to explain its own success, 3M begins with technological innovation. 3M is among the 25 companies with the most patents in the world: 11 of the 25 are Japanese, 10 are American and only four are European. The company spends some 6.5% of its total sales on research and development, almost twice the American average. And that has increased from about 4.5% at the beginning of the 1980s. The increase, part of the response to the less sparkling performance in the mid-1980s, adds a not-insignificant $200 million a year to the research budget. 3M sees its future as lying increasingly outside the United States. Europe accounts for some 30% of the company's worldwide sales and one‑quarter of its employees. That puts 3M among the 300 largest companies in Europe. The company has had subsidiaries in the region for almost 40 years and now has 17 different companies on the continent and 14 major R&D centres. Since 1984 a number of European Management Action Teams (EMATs) have been set up under the direction of Joe Warren, 3M’s Brussels-based vice-president in charge of Europe. Briefly, 3M worldwide is divided into four sectors: industrial and electronics (36% of sales); information and imaging technologies (28%); life sciences (22%); and commercial and consumer (14%). These four sectors are divided into 15 “strategic business centres" (SBCs) -for audio-visual products, abrasives, etc.- and each centre is responsible for three or four of the company's 50 operating divisions. The operating divisions are run like small businesses and 3M staff say that each has its own culture. Global strategy is determined by the business centres in St Paul. 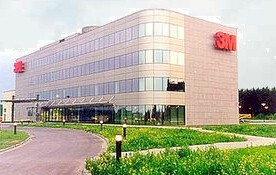 European input comes via group directors (one for each business centre) based at 3M’s European headquarters in Brussels. In addition, the European organisation has a number of product managers (most of them in Brussels) plus managing directors in charge of each of the 17 European Subsidiaries. These subsidiaries are run nationally, with a few exceptions; for example, the MD of Spain is also the MD of Portugal, and the MD of the UK is also MD of Ireland. Each of the 40-plus EMATs corresponds roughly to an operating division and has between eight and ten members drawn from different functions and different countries. Typically they meet every four to six weeks. In theory they have collective responsibility for achieving the company's European goals; in practice they spend much of their time discussing the launch of new products. Although 3M has only 150 Americans working for the company outside the United States (even in the UK there are only six American employees), the language of the EMATs is English. Since these were the first formal means for more junior employees of different nationalities to get together, the early discussions tended to be dominated by the fluent English-speakers: the British, the Dutch and the Irish. Now the company insists that a certain level of proficiency in English is a prerequisite for joining an EMAT, and team members are being trained to learn how to accommodate different cultures. The future depends on how well the company has learnt to adapt to change. One of the greatest changes in its markets is occurring in Europe, and much hangs on the ability of the EMATs to come up with products that will meet the fast­shifting demands of 3M’s European customers. How 3M developed its famous Post-it notes. Spencer Silver was a 3M research chemist whose objective was to produce the strongest adhesive on the market. Although he did not succeed in his mission, he did develop another type of adhesive that had two interesting properties: it could be re-used and it left no residue on the material to which it was applied. However, no one at 3M could find a use for this product and it was put aside temporarily. Ten years later, one of Silver's colleagues, Art Fry, discovered a new use for the abandoned adhesive. Fry sang in a choir and used strips of paper to mark the pages of his hymn book, which fell out every time he opened the book. He therefore decided to apply Silver's adhesive to the strips and found that they marked the pages and did not fall out when the book was opened. This was the first step in the discovery of the future Post-it note, a product that has become really popular all over the world.